For more highlights from 2013, check out our History & Accomplishments page. BCAction’s Information & Referral program continues to be a valuable resource for people who have been diagnosed or who are otherwise affected by breast cancer. Between November 2013 and February 2014, we responded to over 90 inquiries from people on, as always, a variety of topics including the side effects of taking Raloxifene or Arimidex for more than 10 years, the dangers of cell phone use, taking Arimidex to lower risk of recurrence in elderly women, and chemical policy reform. BCAction attended the San Antonio Breast Cancer Symposium in December 2013 to bring a patient-focused voice to the proceedings, to challenge the status quo, report findings back to you, and to push researchers and clinicians to do better for women at risk of and living with breast cancer. Get updates on treatment here as well as a report-back about pyscho-social issues facing women with breast cancer here. In December, we submitted comments to the U.S. Preventive Services Taskforce (USPSTF) regarding their proposed research framework that will lead to updated mammography screening guidelines. You can read the summary of our comments on our blog. In February, new research, this time from Canada, once again questioned the value of screening mammography in the general population. This study found no reduction in mortality among women diagnosed with breast cancer that had been found with or without mammography. Breast Cancer Action immediately went into action raising our longstanding concerns about the lack of clear benefit to the use of mammography for screening (as opposed to diagnostic). This issue of The Source features a response to the study by the chair of our Board of Directors, Tracy Weitz. California Assemblyperson Joan Buchanan introduced AB49 which, if enacted, would create a pink ribbon specialty license plate in California. Breast Cancer Action has expressed concerns about this bill, including that the proposed messaging is misleading and inaccurate. As it stands now, the plate would read, “early detection saves lives” which is especially problematic given the recent Canadian mammography study published in February 2014 in The British Medical Journal! In addition, funds generated by sales of the pink plate only go toward screening and not follow-up treatment, care or counseling for low-income women. BCAction has engaged with Representative Buchanan over the past several months regarding this issue and this winter we stepped up pressure to improve this bill. In December, we sent a letter to Buchanan’s office, once again expressing concerns regarding AB49. This letter was signed by leaders in the breast cancer community in California, including Karuna Jaggar, Executive Director at Breast Cancer Action; Peggy McGuire, Executive Director at Women’s Cancer Resource Center; Sara O’Donnell, Executive Director at Cancer Resource Centers of Mendocino County, and Maria Caprio, Director of Shanti’s Margot Murphy Breast Cancer Program. In January, along with Peggy McGuire from the Women’s Cancer Resource Center, we sat down with Assemblyperson Buchanan to discuss changing the message on the proposed pink plate. Our next steps involve working with the Women’s Cancer Resource Center and other allies to identify and propose alternate messaging to ensure that the pink plate is not promoting inaccurate information about breast cancer screening. In February, we were outraged when we discovered Kohl’s department store marketing a “Kohl’s Cash for the Cure” program. This program, a partnership with Susan G. Komen, was yet another example of corporations making money off breast cancer via pink cause marketing. Kohl’s donated $1 million to Susan G. Komen – but that means shoppers had to spend $50 million at Kohl’s. Breast cancer sure is good for the bottom line! 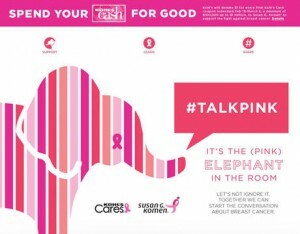 The campaign’s messaging perpetuated inaccurate information about mammography screening, and worst of all, by referring to breast cancer as “the pink elephant” in the room, co-opted the recent “pink elephant” campaign led by our allies at METAvivor to raise awareness about metastatic disease. We called out Kohls’ shameful campaign that diverted attention away from METAvivor’s important work for metastatic breast cancer on our social media platforms encouraged our members to call foul on Kohl’s and support METAvivor. Read more about the impact of the campaign in this issue’s Member Perspective. On June 13, 2013, the Supreme Court ruled to strike down Myriad Genetics’ patents on the human “breast cancer” genes, BRCA1 and BRCA2—and not just Myriad’s patents, but patents on all human genes. This was a tremendous win for women’s health – and for all our health! In the months following the U.S. Supreme Court’s decision, we were alarmed to see Myriad Genetics respond with aggressive lawsuits to preserve their monopoly and keep other BRCA testing companies out of the marketplace. In August, we filed an amicus brief in federal court to express opposition to preliminary injunctions on BRCA testing filed by Myriad against both Ambry Genetics and Gene by Gene, Ltd. – two companies embroiled in lawsuits with Myriad Genetics. Gene by Gene, Ltd. recently settled with Myriad Genetics, and we are happy to report that in early March, Myriad was denied its preliminary injunction against Ambry Genetics. While the legal landscape of this issue is far from settled, we continue to look for ways to ensure that genetic testing companies are properly serving women at risk of genetic mutations linked to breast and ovarian cancer. During the fall of 2013 the Chemical Safety of Improvement Act (CSIA) was introduced in the U.S. Senate as a proposed update to the Toxic Substances Control Act (TSCA). Breast Cancer Action and many other health and environmental organizations opposed the CSIA for its failure to fully protect public health and safety by inadequately addressing the thousands of unregulated chemicals in our daily lives. In March 2014, Congressman John Shimkus (R-IL) released a discussion draft of the Chemicals in Commerce Act that is even worse than the CSIA. This new proposed bill is a gift to the chemicals industry rather than a meaningful effort to protect the public from hazardous chemicals linked to a range of diseases and disorders, including breast cancer. We submitted a letter of opposition to the Chemicals in Commerce Act to the committee charged with debating the bill, and over 1,200 BCAction members contacted their Representatives urging opposition to this bad bill. We will continue to keep the pressure on our elected representatives to reject the Chemicals in Commerce Act, and support truly meaningful TSCA reform legislation instead. 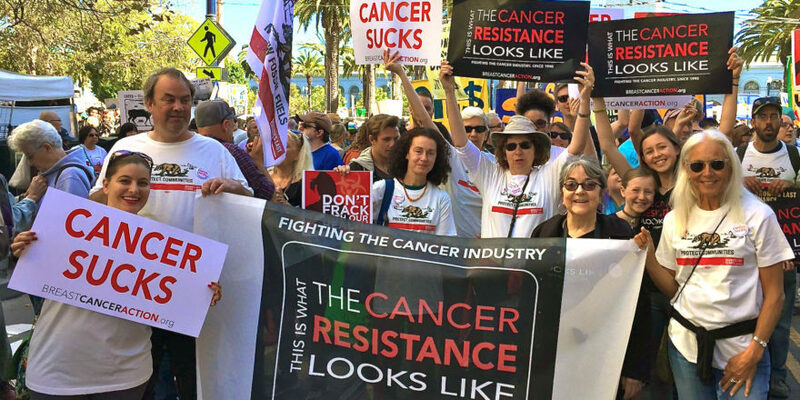 In March, Breast Cancer Action endorsed and participated in Don’t Frack California, the largest anti-fracking rally in state history. The rally, on March 15th in Sacramento, demanded Governor Gerry Brown ban fracking across the state. Fracking is a public health issue, plain and simple, and as advocates for women’s health, we will not stand silently by and allow this dangerous practice to continue. In existence for over a year, our Community Leaders for Change program (formerly the Speakers Bureau) continues to support and train women across the country to serve as leaders about breast cancer issues in their community by facilitating discussions and providing education and outreach at health/community fairs, house parties and other community events. In November, we reached out to all 31 women who have been involved with the program since its inception to conduct a one-year program evaluation. We thank all the respondents and look forward to incorporating their feedback to improve the program. For more information about the Community Leaders for Change program or to become a Community Leader, please contact Sahru Keiser at 415-243-9301 x14 or skeiser@bcaction.org.